Okay, so you’ve got yourself a quality ping pong table and a set of paddles, but now you need some good ping pong balls so you can start playing. You might be tempted to go out and buy the cheapest table tennis balls that you can find. Well, you could do that, but we don’t think that’s a good idea. You see, they may all look the same, but ping pong balls can vary in quality and if you end up with a cheap, crappy ping pong ball, then your game play is affected. And you don’t want that, right? Below we’ll tell you what to look for in the best ping pong balls for the money, as well as give you some of our recommendations on the best buys right now. Before you try to navigate all the various options of table tennis balls on the market, let us give you some tips on what you should be looking for in table tennis balls. We don’t want you to end up with low quality ping pong balls, so we’ve created this guide to help you get informed on what you’re buying. You’ll notice that some balls are made of celluloid while others are made of plastic polystyrene (poly). 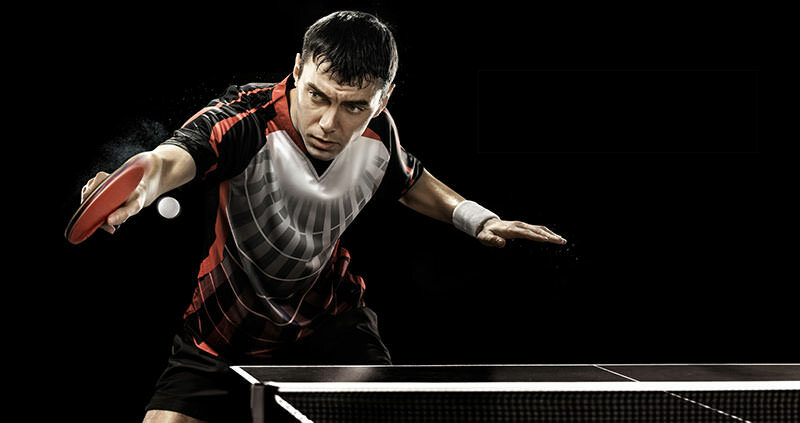 We suggest that you choose poly balls, which the International Table Tennis Federation (ITTF) made the standard choice for all official events. While both types play similarly during a game, the poly ping pong balls are more environmentally friendly and easier to transport safely. However, the celluloid balls are typically cheaper in price and a bit more durable. That being said, we recommend you stick the ITTF standard of the plastic poly option. One other thing to note is that the celluloid balls are 40mm and the plastic poly balls can be slightly larger, so you sometimes see the poly balls listed as 40+ for the size. If you see a table tennis ball and aren’t sure what it is made of, you can just look at the inscription on it. The poly balls will have “40+” printed on it while the celluloid will have “40mm” or just “’40” printed on it. The Preston Table Tennis Association made this helpful video that really dives in and breaks down the differences between these two types of table tennis balls. Give it a watch below if you want to know more about the differences between the two. What Does The Rating System Mean? As you compare the different ping pong ball options on the market, you’ll notice that they all have a star rating, which ranges from one to three stars. Under this rating system, a three star means the highest quality and a one star is the lowest quality. This means you should look for three star table tennis balls most of the time. The training balls and the 1-star and 2-star balls are less durable and will actually break quicker than the 3-star options. Two-star balls are medium quality and a bit firmer than a one-star ball. These are ideal for multi-ball practice, improving your game, or for use in a training robot. Three-star balls are the highest quality and firmness. This is what you should use for game play and this rating level is the only one approved for tournament play. If you’re just practicing some multiple-ball drills, like smashes and serves, then you can use good training balls or a bulk 3-star pack just for this purpose. Practice or training balls do not have a star rating. This type of table tennis ball is good for children or beginners who are just practicing the game. They are not that durable and can break when hit too hard. You should never play an actual game with a practice or training table tennis ball. Novelty balls also tend to not have a star rating. Instead, they are rated from very soft to very hard, and sometimes you get a mixed variety in the pack. While you can use these for game play, keep in mind that they are just for fun and should never be used as your primary game ball. For legal tournament play, the only acceptable colors are white or orange. However, if you are just playing some games for fun, then you can choose any color that you want to use. Just be sure to pick a color that is easy for you to see during the game play. What’s The Difference Between Beer Pong Balls and Ping Pong Balls? If you’re in the market for some new beer pong balls and wondering if you can get just a regular ole pack of ping pong balls, then the answer is Yes! The truth is that there is no difference between the two. You play beer pong with ping pong balls, so even though some are sold as ‘beer pong ball’ the truth is that they are a normal set of table tennis balls. So in the debate of beer pong balls vs ping pong balls, there’s no difference because beer pong balls are the same as ping pong balls. To help you make a good decision on the best ball for your table tennis needs, our editors share their reviews on their favorite options on the market right now. Keep reading to learn why we like the five models listed up above. These high quality plastic poly balls get our top pick as the best ping pong ball for the money. They are made in Japan and surprisingly difficult to find outside of the country. We think that you can really tell a difference when you play with these compared to the other models we’ve selected. They have a good bounce and just might be the best ping pong ball for spin, if that is important to you. Overall, we think that you get more control over where the ball lands when you play with this Nittaku model. At the time of this publication going live, you can order these in a 3-pack, so you might want to get yourself more than one box to stock up. The only real downside to these is that they do tend to be on the higher end of price spectrum, but we honestly feel that the quality you get is worth the cost. In fact, after playing with these, we think it’s difficult to go back to cheaper options. And if you’re shopping for the best beer pong balls, then we highly recommend these since they have a great bounce to them. These poly balls are made in China and honestly are the best made in China option that we’ve come across so far. They are seamless, which is definitely what we suggest that you look for when shopping. And they are probably our second choice after the Nittaku ball listed up above. So, if you’re on a tight budget and need the best quality you can get for the money, but don’t want to pay the premium price for the Nittaku, then we think that this is your best bet. We think that the Xushaofa also offers a good bounce and spin, though not quite as good as the Nittaku! And the price is very affordable. At the time of publication of this article, you can order these in several different quantity options, from a 6-pack up to a 144-box. If you’ve ever played with the Butterfly 40+ balls, then you’ll notice that the Xushaofa ball doesn’t make that annoying plastic sound when they bounce or are hit. Sure, that’s a minor annoying of the Butterfly, but if you play a lot, then you’ll definitely appreciate it! Curious how a ping pong ball is made? The staff at Pingsider have shared this informational video that gives you the basics on what it takes to make one of these. Check it out in the video below. When a ball falls to the floor, be sure to pick it up immediately. This reduces the chances that someone will step on it and damage it. You can clean the ball with a damp, clean cloth. Remember to dry it off instead of letting it air dry. Do you have a lot of ping pong balls to clean, such as if you’ve been using them with a robot? You can put them in your washing machine on a no-spin cycle with cold water only to get them clean. Or, you can fill a bathtub or sink with cool water and mild dishwashing liquid, where you can let them soak before cleaning them.